Please read the following carefully. If you have any questions or concerns, please send us an email at info@rootsgroup.co.za. Roots Group will never willfully disclose any personally identifiable information about our online audience to any third party without first receiving the user’s permission. We do not collect personally identifiable information from our visitors other than what is supplied to us on a voluntary basis. Visitors to the Roots Group Web Site may voluntarily supply certain personally identifiable information in connection with (i)contest or sweepstakes registration, (ii) subscription registration for sites or services which require subscription (such as email newsletters), (iii) requests for membership information and (iv) e-commerce transactions. In addition, personally identifiable information is voluntarily provided in connection with certain content submissions, community postings (i.e., forums or bulletin boards), comments and suggestions, or voting. Roots Group may use such information only for conducting the activities stated above, for internal marketing and promotional purposes, or, on occasion, when mailing lists are made available to other organizations. (The occasional provision of mailing lists to such organizations is the only case where such information would be provided to third parties). From time to time, Roots Group may update this privacy notice. We will notify you about material changes in the way we treat personally identifiable information by placing a notice on our site. We encourage you to periodically check back and review this policy so that you always will know what information we collect, how we use it, and to whom we disclose it. Your continued use of the Roots Group Web Site following the posting of any changes to these terms shall mean that you have accepted those changes. Should you have other questions or concerns about these privacy policies, please email us at info@rootsgroup.co.za. Roots Group has not reviewed all of the sites linked to its Internet web site and is not responsible for the contents of any such linked site. The inclusion of any link does not imply endorsement by Roots Group of the site. Use of any such linked web site is at the user’s own risk. The materials appearing on Roots Group’s web site could include technical, typographical, or photographic errors. Roots Group does not warrant that any of the materials on its web site are accurate, complete, or current. Roots Group may make changes to the materials contained on its web site at any time without notice. Roots Group does not, however, make any commitment to update the materials. 1. Any specials advertised for 1 day implies that they are only valid for the specific day advertised, within the working hours of the relevant store. 2. No deviation or substitute can be made to the items advertised. 3. Special is subject to stock availability. 4. The store has the right to limit quantities per customer, to ensure most customers get the benefit of the special price advertised on the respective items. 5. Roots reserve the right to cancel the special advertised at any time, if deemed necessary in their opinion and/or if circumstances arise outside of their control. No participant shall have recourse for such cancellation. 6. Roots reserve the right to change these terms and conditions at any time. 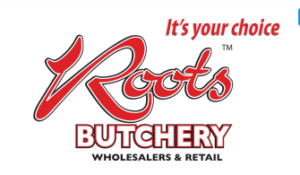 Roots Butchery will refund perishable items should our customers not be happy with the quality thereof, provided the product is within expiry date and is in its original packaging, together with the original receipt of purchase. Should there be an issue with the product – it should be brought back to the store with its original packaging. Where a customer wishes to returns goods because the customer has changed their mind, Roots Butchery will not accept the return with respect of the particular purchased item, this is due to public and food safety regulations.